Strawberries and champagne—the ultimate romantic hors d'oeuvre. Honestly, who doesn't remember Pretty Woman, when Julia Roberts coyly excuses herself to floss after eating strawberries? It's one of my favorite scenes. Strawberries and romance share a long history. With its heart shape, the strawberry symbolized Venus, the Goddess of Love. In France, newlyweds received a soup made from strawberries, sour cream, borage, and powdered sugar to serve as an aphrodisiac. And if you're looking to fall in love, just break a double strawberry in half and share it with your crush. According to legend, you'll soon be inseparable. With its rich mythology and delicious history, is it any wonder that strawberries are a main ingredient in Valentine's Day? Chocolate covered, tarted up, or baked into a pie, strawberries are the fruit of love. Actually, it's perplexing. Strawberries aren't in season on Valentine's Day--unless you live in Florida or California. And honestly—nothing compares to the deep, rich, sun-warmed sweetness of just-picked strawberries. So, although they're the fruit of choice for Valentine's Day, strawberries eaten on February 14 hardly compare to the backyard berries of spring. Growing strawberries is simple. Often, gardeners become intimidated when researching how to grow strawberries. Rows or mounds? Plastic or straw? June-bearing or everbearing? While there are many options for varieties and growing methods, the process doesn't need to be complicated for a home grower. In our garden, for instance, strawberry plants serve as a border in our potager. As the strawberry plants in the potager grew new runners, I harvested the babies and began a new bed by the greenhouse. And when we harvested more runners, the kids planted them in their raised bed garden. We didn't mound, we don't use plastic—and we definitely don't use any spray. Our result? Hundreds of perfect, achingly sweet organic strawberries—in three small beds. Large commercial growers, of course, treat their strawberry crops differently. Because strawberry plants decline in production after two years, commercial growers treat the plants as annuals. In our zone 7b garden, however, our strawberry plants are perennials, performing year after year, until we notice a decline. (We haven't yet.) Then, as our plants slow in production, we'll replace old plants with runners we've harvested from other beds, ensuring an endless supply of fresh starts as we need them. Strawberries may be my favorite perennial plant. June bearing (spring bearing) strawberries produce a crop during a three-to-four week period in the spring, with the duration based on the climate. June bearers produce flowers, fruits, and runners and are classified into early, mid-season, and later varieties. June bearing plants are ideal if you want a large harvest at once to make jams, for instance. Everbearing strawberries produce three periods of flowers and fruit: spring, summer, and fall. Day neutral strawberries produce fruit throughout the growing season, producing only a few runners. These plants work well for gardeners with limited space or who want to incorporate strawberries into borders or containers. Isn't this a great idea? Strawberry baskets for space-challenged gardeners! In cold climates, plant strawberries as soon as the ground can be worked in the spring. In warmer climates, fall planting is ideal. 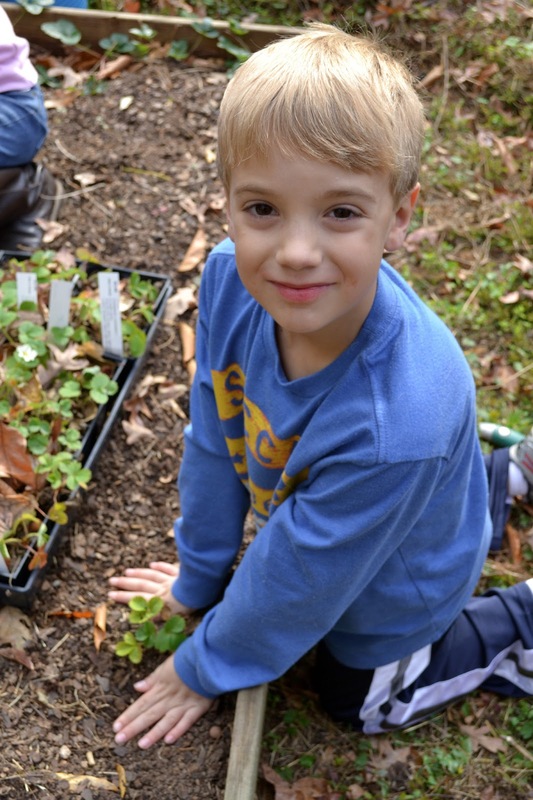 Strawberries prefer well drained soil, rich in organic matter. Plant in an area that receives at least 6 hours of sun for best fruit production, and ensure the plants receive at least an inch of water per week during the growing season. Don't plant strawberries in a bed where peppers, tomatoes, eggplant or potatoes resided. Strawberry plants are susceptible to verticillium wilt, which can be spread by nightshade plants. Like all transplants, strawberries should be planted on a cloudy day or during late afternoon, rather than in full sun. 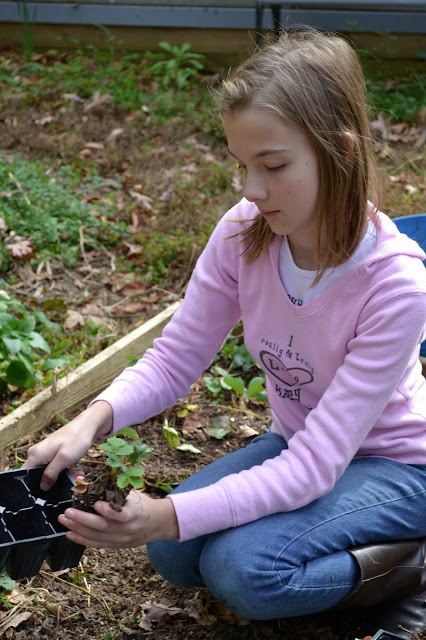 Set the strawberry plant in the soil so that the soil is just covering the tops of the roots. Do not cover the crown. After four to six weeks, the plants will produce runners and new plants. When you research planting strawberries, all of the experts will tell you to remove the flowers of the newly planted strawberries during the first season to develop strong roots and runners. The goal is to ensure a large crop the following year. In fact, I've never pinched back the flowers. And guess what? We had a nice little, delicious harvest the first year...and the second year, we could barely keep up with harvesting the berries. Spring frosts and freezes can wreck havoc on your strawberry patch. Mulch or row covers can protect the blossoms. In colder zones, a thick layer of straw provides good insulation for strawberries. Remove the top layers in the spring, but keep it close by in case of a late frost. Additionally, mulching with straw around the base of the plants helps retain moisture and keeps the fruit off the soil, which can promote disease and pest damage. Always remove any damaged fruit or dead leaves to avoid pests or disease. Wait to harvest until the berry is fully ripe. Unlike some fruits, strawberries do not continue to ripen after harvest. Leave an inch of stem attached, and refrigerate to preserve freshness. Wash immediately before use. In honor of Valentine's Day, I baked a classic romantic dessert: Strawberry Tart. It's February, so I admit--I used store bought Florida berries. Still, it was pretty delicious. Now, imagine it with fresh, just-picked strawberries...oh my. This is definitely a recipe to make again in May. Mix first three ingredients together, then add 1/3 cup butter and 2 tablespoons shortening. Mix until crumbly. With mixer running, slowly add 3 tablespoons water. Mix until dough forms a ball, adding more water as needed. Wrap dough in plastic wrap and chill for 1 hour. Bake at 425 degrees for 15 minutes. Remove the weights/beans and parchment paper. Bake an additional 3-5 minutes. Combine ½ cup sugar and cornstarch in a medium saucepan. Whisk together half-and-half and egg yolks. Gradually whisk half-and-half mixture into sugar mixture in saucepan over medium heat. Bring to a boil and cook, whisking constantly, 1 minute. Remove mixture from heat. Stir in 3 tablespoons butter and vanilla; cover and chill at least 4 hours. Spoon into prepared pastry shell. Top with sliced strawberries and serve immediately. So, are you ready to plant your strawberry patch? I promise—You Can Grow That! Join us on the 4^th^ day of each month to find out how You Can Grow That! Shared on Wildcrafting Wednesdays, Home and Garden Thursdays, Farm Girl Friday Blog Fest, and Little House in the Suburbs.